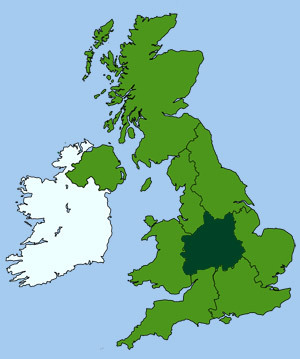 England's greatest dramatist and poet William Shakespeare was born in Stratford-upon-Avon, which has become one of Britain's biggest tourist centres after London. Stratford is a small and delightful old market community, in the rural heart of England. With its many memorable buildings, broad streets, meadow-flanked river and canal filled with bright narrow boats, it would be a rewarding place to visit even without its links with Shakespeare. 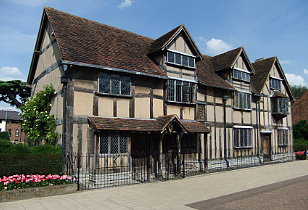 Any tour of the town would not be complete without a visit to one of the most famous timber framed houses in Britain - the birthplace of William Shakespeare. Britain's most famous Bard was born in Henley Street, on or near April 23, 1564. His father, John Shakespeare (recorded as Shakspere in the parish records) was a glover and wool dealer who later became the town's bailiff. His mother, Mary Arden, was the daughter of a yeoman farmer from the nearby village of Wilmcote. The house, complete with cider-mill, dovecot and other outbuildings, dates from the early 16th-c and has been owned by the Shakespeare Birthplace Trust since 1930. It is open to the public and more than 500,000 people visit every year. The rooms are furnished with items typical of middle-class homes of the time. Access to the house is via the Shakespeare Centre, located next door. Despite its modern appearance, the interior is furnished in a style in keeping with the era. Anne Hathaway, a local farmer's daughter, married Shakespeare in 1582. The thatched cottage that was her home is located in Shottery, 2 miles from the centre of Stratford. The Royal Shakespeare Theatre, built on the riverside in 1932, stages many consistently outstanding productions of Shakespeare's plays, which draw audiences from all over the world. Hall's Croft: another of Shakespeare's family homes. Judith Quiney's House: home of the youngest daughter of William Shakespeare. Harvard House: a late 16th century timber frame house, the stained glass windows are 14th century. Theatre Picture Gallery and Museum. Guildhall: a Tudor half-timbered building, used for centuries a grammar school. New Place and Nash's House: another of Shakespeare's family homes. Holy Trinity Church: church where Shakespeare was baptised and buried. 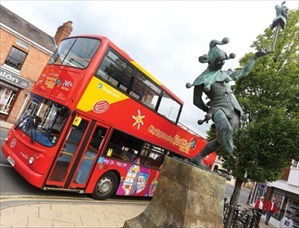 CitySightseeing Stratford hop-on-hop-off buses are the most convenient way to explore this historic town. The open-top buses stop at all of the town’s major attractions where you can hop off and on at your leisure as many times as you like. Many of the buses have a live guide who are full of hilarious and fascinating stories about the sights you’ll see. Plus there’s a recorded “Kid's Commentary” to keep the little ones entertained! Location: The first stop is at Avon Boating, Swans Nest Boathouse (Swans Nest, Stratford-upon-Avon CV37 7LS) but you can hop on or off at any stop along the route.